Two 20-somethings arriving from the U.K. learned a harsh lesson about the American government's sense of humor on Monday, Jan. 23, when they were detained and then forced to return home due to comments they made on Twitter. According to the Daily Mail, Leigh Van Bryan, 26, and Emily Bunting, 24, were going through Customs when they were detained. The two spent the next 12 hours locked up in a cell, being grilled by Homeland Security officials. Bryan was charged with intending to come to the U.S. to commit crimes, while Bunting was charged for traveling with him. 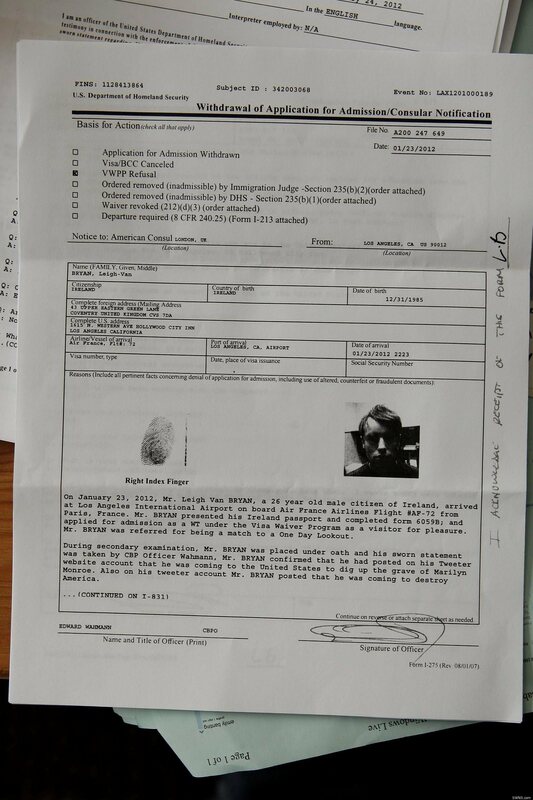 Paperwork for the incident indicates that Bryan's name was on a "One Day Lookout" list maintained by Homeland Security. According to the New York Post and World News Daily, this refers to an auto-generated temporary list of inbound travelers that are already in the official terror watch list database. The paperwork also referred to Bryan's tweets, incorrectly stating they came from his account on "Tweeter." During secondary examination, Mr. Bryan was placed under oath and his sworn statement was taken by CBP Officer Wahmann, Mr. Bryan confirmed that he had posted on his Tweeter [sic] website account that he was coming to the United States to dig up the grave of Marilyn Monroe. Also the tweeter account of Mr. Bryan posted that he was coming to destroy America. The tweets had been sent a week before their trip, indicating the U.S. government had flagged the pair well before their arrival. Both claimed the messages were lost in translation. "They asked why we wanted to destroy America and we tried to explain ['destroy'] meant to get trashed and party," Bunting told the Daily Mail. Bryan also said he was asked about a tweet that he says is a quote from the television show 'Family Guy' that read, "3 weeks today, we're totally in LA p***** people off on Hollywood Blvd and diggin' Marilyn Monroe up!" "I almost burst out laughing when they asked me if I was going to be Leigh's lookout while he dug up Marilyn Monroe," Bunting told the Daily Mail. "It got even more ridiculous because the officials searched our suitcases and said they were looking for spades and shovels." But things quickly became less humorous to Bryan and Bunting. Speaking with the Daily Mail, Bryan said officials told him, "You really f***** up with that tweet, boy," before handcuffing and putting him in what Bryan described as a "cage" inside of a van. He said he was then transported to a prison with other border offenders. "It's just so ridiculous it's almost funny but at the time it was really scary. The Homeland Security agents were treating me like some kind of terrorist," Bryan told the Mail. "We just wanted to have a good time on holiday. That was all Leigh meant in his tweets," Bunting told The Sun. This isn't the first time a tweet has gotten someone in trouble with the U.S. government. And other social media outlets, such as Facebook, have also been used by police to prevent potential crimes. Just last week, an Arizona policeman drew a Secret Service probe for posting a photo of a man holding a T-shirt with the image of President Obama riddled with bullet holes. This news comes at a time when Internet privacy and censorship are hot issues. Just last week, controversy erupted when Twitter revealed it would comply with censorship laws in countries like China and Thailand where much of the content on the internet is restricted. UPDATE: Leigh Van Bryan is originally from Ireland but currently lives in Coventry, U.K., while Emily Bunting resides in Birmingham, U.K.